Is Plastic Surgery On Your Pet For Cosmetic Reasons OK? As you know, I’m quite passionate about health and food and looking after myself and encouraging people to look after themselves. But I am also passionate about how looks aren’t everything and we should aim to be healthy for our health sake, not aim to be skinny just to fit into the ‘perfect world’ we live in, where professional women would rather choose to be pretty than smart. That’s all fine and I do understand that a lot of people still want to fix things on their appearance with surgery. For their own self esteem, maybe after cancer or after major injury. But, I do think that should be limited to yourself and your image, not to your pets? Wouldn’t be much left of this cutie, would it? Is it just me or is this beauty thing just going completely overboard? I did have a bit of a laugh when I realised people are taking their pets in for plastic surgery. But then last night when watching MasterChef (did I mention I love watching any cooking show that’s on TV?! Yum!) there was an ad break (as there is, every 10 minutes) and there was an ad for (wait for it, waaaaaiiiiit for it) Diet Dog Food. Diet. Dog. Food. Just say those words out loud to yourself a few times and listen to how crazy that sounds. Why (and I really mean Why with a capital W) would you start giving your dog Diet food? It says on their website, because I had to have a look, the food “has 20% less fat, perfect for keeping your special friend vivacious, healthy & happy without compromising on taste or nutrition”. Now, that’s a lie, because if you’re taking 20% of the fat out, you are in fact compromising on nutrition. And if you have ever tasted full fat cheese and then low fat cheese, you know that the full fat cheese tastes a million times better than the low fat. That’s why chefs use butter and cream when cooking. Because it tastes delicious. And why would you take fat out of your dog’s diet and add something else (probably carbohydrates or something artificial!)? I grew up on a farm, as you may know by now, and we’ve always had dogs. And they have always eaten leftovers from dinner and similar things. They usually would put on a little over winter, when being less active, due to the cold weather, then shed it over summer when it’s warm and they can run around everywhere. So, how about, instead of taking your dog for plastic surgery to have a liposuction or putting your dog on Diet Food, you take him for a walk? Or even a run (I know, I must be crazy)? If your little canoodle has put on a little fat, because you have been overfeeding him with stuff that he wouldn’t normally eat (do you see many overweight animals out in nature? No, I thought so – because there they eat the food they are meant to eat, not processed ‘food’ with lots of additives and preservatives and E here and E there), shouldn’t it be your responsibility to make sure that he can move enough to burn all that excess energy? Don’t buy diet food, just feed him a little less than you have been or go for an extra walk. If you “don’t have time” to walk your dog, why have you got a dog in the first place? And believe me, you have time, just like you have time to exercise every day (and here you are really doing two in one, so it’s a win-win). I’m sorry, I couldn’t help myself. 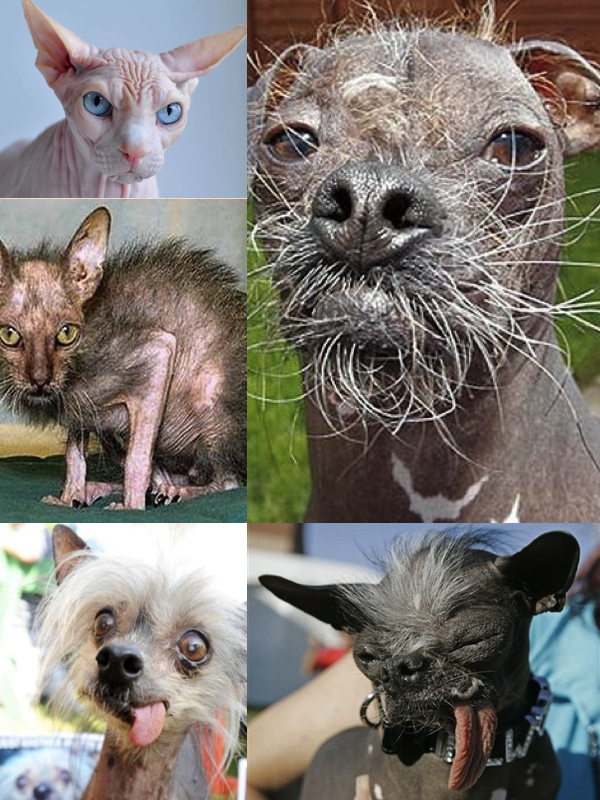 These guys don’t stand a chance to the beauty pressure in the pet world these days.. I do understand taking dogs to surgery for illnesses such as cancer, but I don’t get how you can put your dog under the knife because his ears are too floppy for your liking. That’s like giving birth to a perfectly healthy and normal baby and saying; “I don’t like her nose, I’m gonna get her a nose job before she is old enough to make her own decisions. I am sure she will be happy with it.” It’s just a little mad, don’t you think? When did outer beauty (who cares if you’re a nice person on the inside or a really good guard dog, if you’re not perfect on the outside?) become so utterly important? When did it become important for a pet to have straight teeth and no wrinkles? This world is really going mad, isn’t it? Or maybe it’s just me? Am I overreacting? 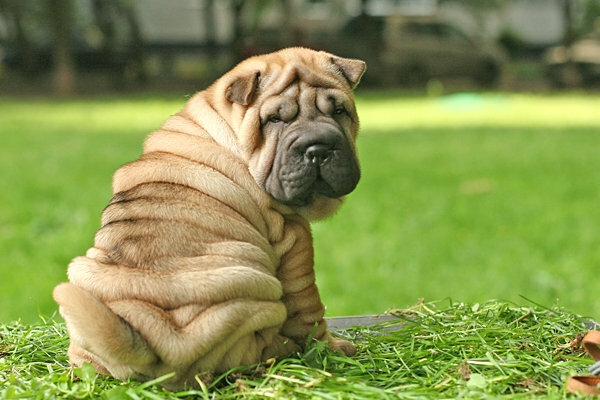 Is it ok to inject Botox into your pet? What do you think? This entry was posted in Diet - Oh All The Diets, Food, Uncategorized and tagged beauty, botox injections, Dog Diet Food, Dog Plastic Surgery, Eyebrow Correction, health, Inner Beauty, Outer Beauty, Overweight Dogs, Plastic Surgery For Pets, Teeth Straightening, The Gods Must Be Crazy. Bookmark the permalink. 9 Responses to Is Plastic Surgery On Your Pet For Cosmetic Reasons OK? WHAT!? This is absolutely crazy and makes me so angry! You are definitely not overreacting! I’m not against plastic surgery in general, even though I’m not a fan of it, if you think it’s going to help you feel better, then go ahead and take that risk. But it’s not ok to make that decision on someone else’s behalf! Your baby analogy is spot on. I think waaay too many people think having a pet is just having another toy or accessory. IT’S NOT. Sometimes I think there should be a license to be allowed to own a pet. Aah, now you got me all worked up, haha! I’m glad there’s more sensible people out there, who still has got some common sense 🙂 It’s crazy! I am surprised this is even legal! I am sure the RSPCA would have something to say about it! If you are too lazy to provide your dog with as much exercise as they need, which for some breeds of dog is a lot, then don’t get a dog! The problem is people who work all day and live in tiny flats in a city decide it is a good idea to have a dog like a Malamute or Greyhound some such thing that needs to run for miles! Oh…no hang on…that last sentence is too long…the problem is people! There are stupid people out there, and they seem to be give free reign. This makes me angry…so I will shh now before I start full on ranting! I know, my dad’s favorite saying it; there’s a lot of stupid people out there..